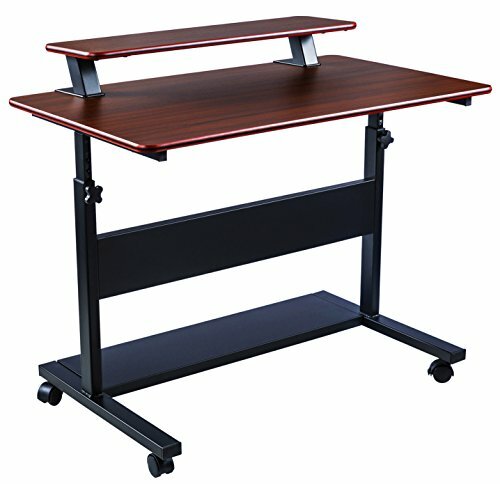 This attractive motorized standing desk comes with several different color options. While it is a bit pricier than others at just under $500, the height is adjustable. It includes 4 memory buttons to make finding your settings, as well as those of your family, more convenient. In addition, the ergonomic shape makes it an ideal choice for your home office. 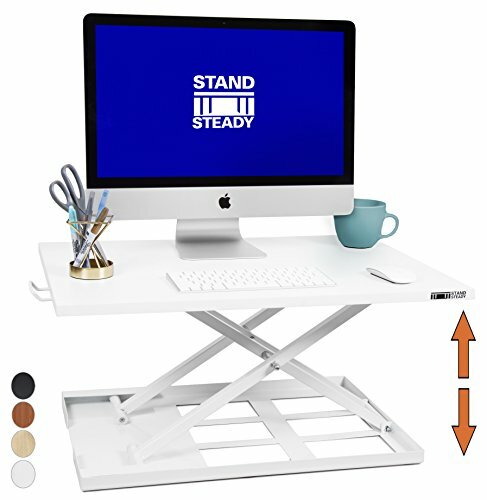 One of the best standing desk options to choose from is the height adjustable standing desk converter. It has pneumatic, smooth adjustment allowing you to easily set the height to your comfort level. It has room for two monitors on the top tier and includes a spacious area for your keyboard and mouse. 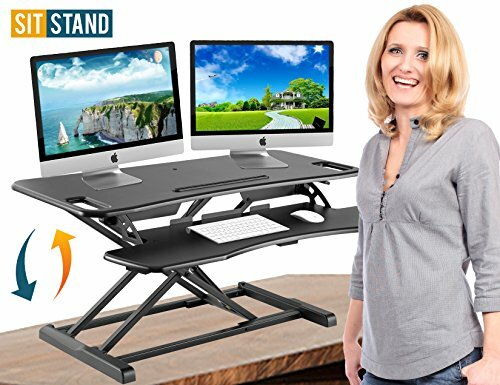 This standing desk converter comes in at under $200 and includes a money back guarantee. 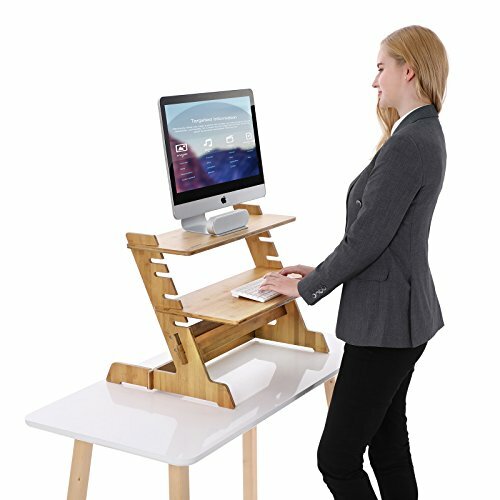 If you’re eco-conscious you might like the bamboo standing computer desk for your home office. This is one of the best standing desks as far as price goes, coming in at just over $100. It’s easy to assemble using just four screws. It’s also lightweight and doubles as a monitor stand when you’re sitting. 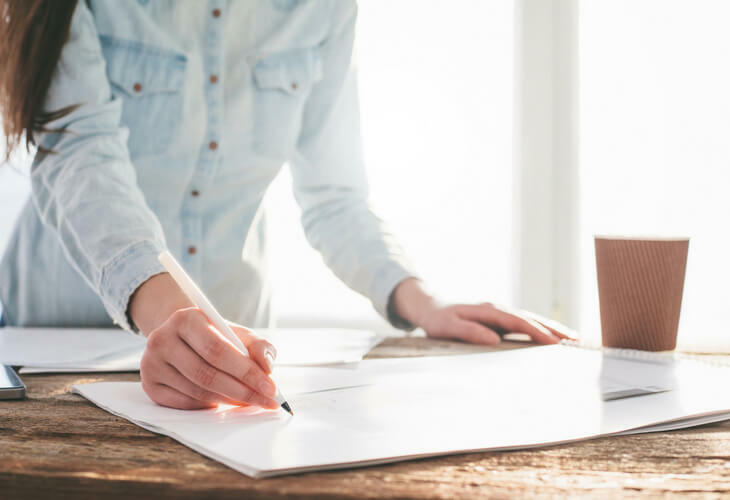 Having one of the best standing desks is the key to efficiency in your home office. But it should also be both pleasing to the eye and functional like this height adjustable large office desk. This desk has different color options to fit in with your home décor. In addition, it has versatility because of its good looks and sturdiness. It can double as your bar height dining table simply by adding 4 bar height stools. Yet, at the same time, it still has lots of room to hold two monitors plus whatever you’re working on. 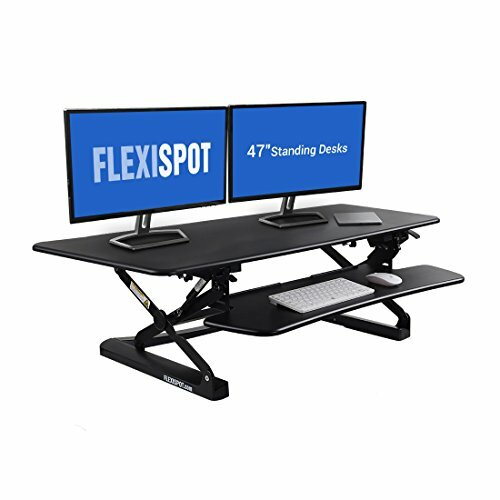 If you’re looking for economy along with speed, the standing desk X-elite has it. Within 3 seconds you can go from sitting to standing using the pump-assisted lift. There are four different color choices and it comes fully assembled. It’s also priced right at under $200. This black ergonomic stand up desk could be just what the doctor ordered for your home office. The shelves adjust in 1” increments to help you fine tune the height to meet your needs. Having two shelves instead of just one allows you to put a computer monitor at just the right height. Additionally, the casters let you move from room to room easily but lock in place when you need them to. At just under $200 it’s priced to fit easily into your budget and home office. Although, there is one drawback. To adjust the height it must be taken apart and reassembled. The AlphaBetter Desk rings in at a little over $200 in price but has some great features. It’s a student style desk with a pencil groove and a shelf for all of your supplies. It even has a footrest when you feel the need to shift your standing position. 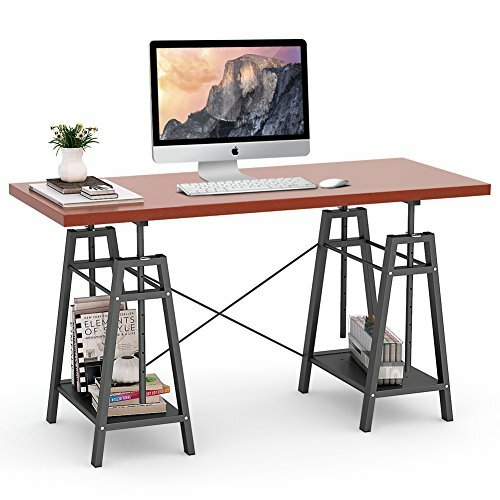 Since some of us have the art bug, this drawing sit/stand desk might be picture perfect. 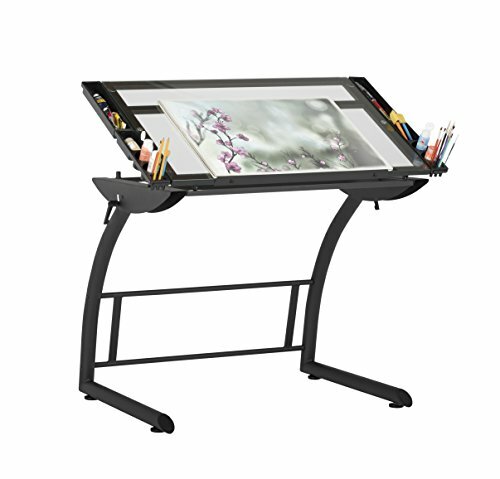 At just over $200 it’s priced right and has plenty of storage space for your drawing needs. The clear surface allows you to add a light if you wish and it also lays flat or tilts as needed. A unique feature of the FlexiSpot Standing Desk Converter is the quick release keyboard tray. Sometimes the tasks you’re doing don’t require a keyboard. When that happens you can easily remove it and put it back on later when it’s needed again. Just one hand is all that is needed to adjust the height of this desk converter. It also stays within its own footprint so you don’t have to worry about collapsing it on top of something. At just under $350 it’s well worth the money. The Eureka adjustable standup desk is mobile and comes with a detachable hutch for under $200. It’s another among the best standing desks you could choose for a home office. It has a place for your CPU as well as casters so it can be easily moved. The height adjustments are in 1” increments to ensure maximum comfort for whoever uses it. Do you need a standing desk for smaller spaces? If so, the VARIDESK compact standing desk converter might solve your problem for less than $200. Its small size and lightweight design is perfect for a small home office. You can even take it on the go straight out of the box. Putting a desk in your home office shouldn’t mean sacrificing looks. This beautiful, reclaimed wood standing desk has both functionality and beauty priced at under $1,000. With two different wooden top choices it’s sure to fit in with your decorating style. It has two motors for safe and fast adjustment. This rustic piece includes four memory setting for easier height changes. When you want a desk that is perfect for you, choose all of the options yourself. That is what the Xdesk Wynstone offers. But there is much more to it than that for a little over $5,000. It’s made of natural bamboo with a solid steel frame and has four power adjustable columns. 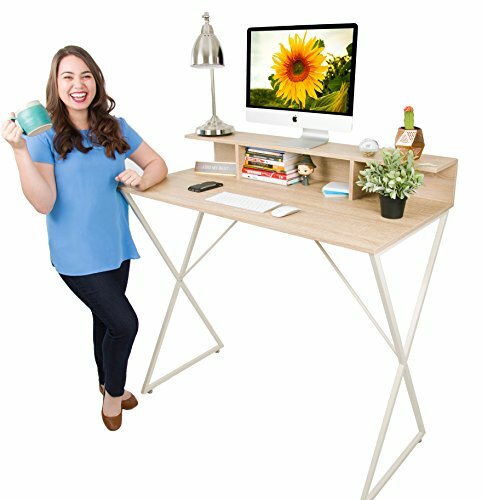 In a mere 5 seconds you can go from sitting to standing with this premium standing desk. 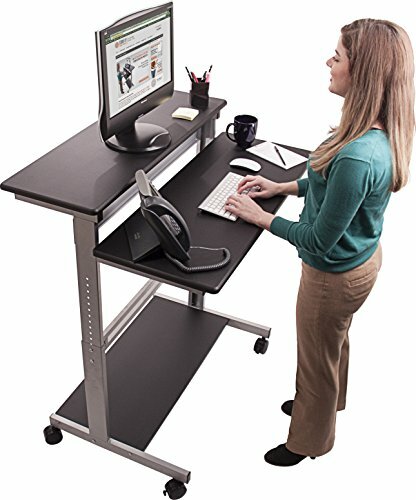 This height adjustable sitting/standing desk is made to order. Constructed of sturdy pine or oak it’s one of the best standing desks you can buy for under $600. You’ll get seven different finish choices with this standing desk. Add a monogram for a little extra cash and go from sitting to standing in style. Bonus tip: Use Ebates to earn cash back on this purchase! 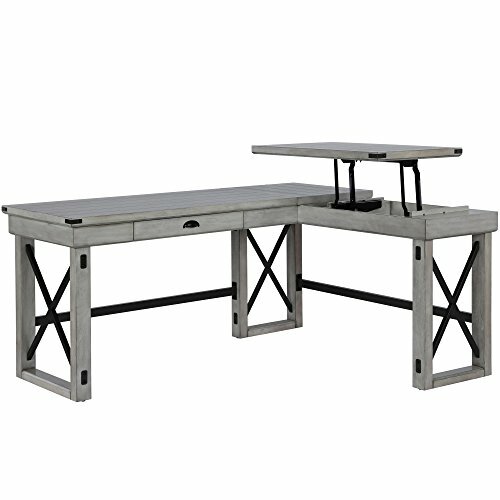 Choosing the Modern Standing Desk Workstation allows you to have an ergonomic work surface. It is one of the best standing desk because it provides cubbies to help you stay organized. Other pluses include the extra level for your monitor and a great price at well under $200. 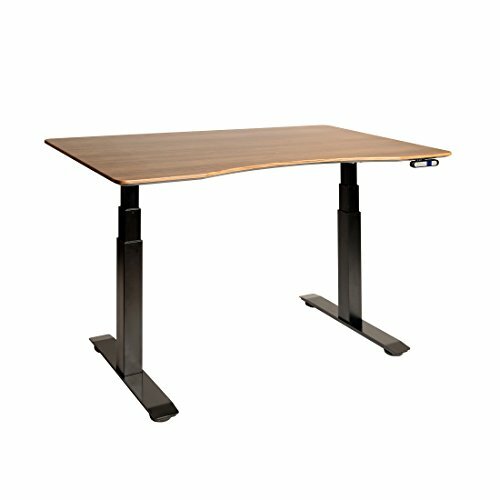 If you need room to spread out and like L shaped desks, the Ameriwood standing desk has you covered. Priced at under $400 it proves a rustic accent to your home office. It includes a supply drawer to keep you organized. Because it has a lift top, you can go from sitting to standing with ease. 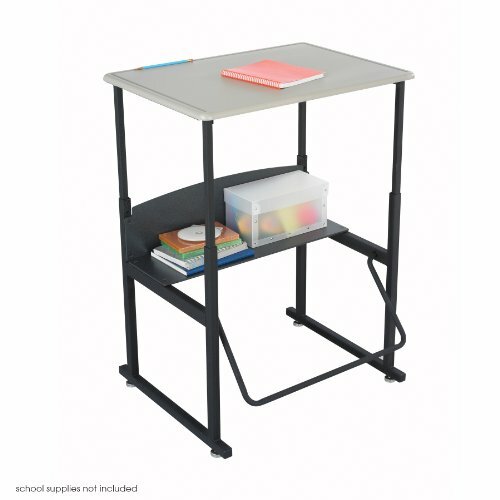 When a simple surface is all you need, this inexpensive standing student desk from Walmart might just make the grade. It’s priced for the student budget at under $100. Although it isn’t adjustable, it’s wood and metal design fits in with today’s modern industrial look. An industrial office standing desk with steel and reclaimed wood materials can be yours for less than $400. There’s even an optional to add drawers. There are several different sized to choose from along with six different wood finishes. This desk is sure to be a charming addition to your home office. Another of the best standing desks for homes with small footprints is the wall mounted space saving desk. This little gem has it all including a work surface, built-in bulletin boards, and organization for under $300. There are four finishes to choose from. However, you can order it unfinished and paint or stain it to match your home furnishings. Another of the best standing desks for the money is the vintage made to order standing desk. Starting at a bit under $550 you can choose the size and finish that fits best in your home. Each of these desks has a farm house feel which fits right in with current decorating trends. Because the wood is reclaimed, every vintage standing desk you order is unique. Although standing desks seem to be one of the newest fads they actually have health benefits. After eating lunch do you sit down in your home office and work at your desk? If you answered that question with a “yes”, you could experience blood sugar level spikes. To combat the problem, try switching off between sitting and standing while you work. According to some physicians, too much sitting at a desk makes back pain worse. That’s one reason to use a standing desk in your home office. The longer you sit the more likely you are to lose good posture. Of course you can always shift positions and reset your posture. But that’s another reason standing desks are beneficial: They help you regain good posture. Need another excuse to try a standing desk? Using a standing desk can help to reduce obesity. You will use more calories which may result in your weight dropping. In truth, neither sitting nor standing too much is good for you. But having the ability to trade-off between the two does provide benefits. To help you get the benefits of both sitting and standing, use one of these standing desks or converters. You’ll be healthier and happier for it. Have you ever tried a standing desk?